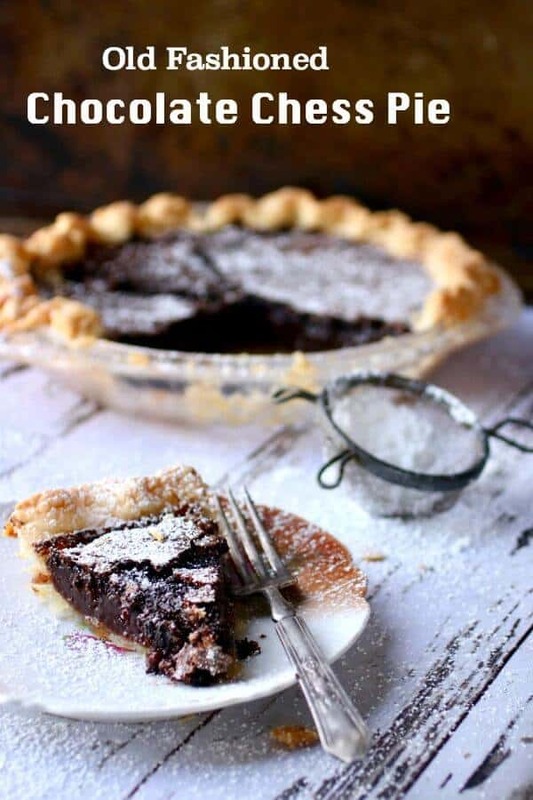 An iconic Southern dessert recipe that’s ridiculously easy, chocolate chess pie is like eating brownie batter in a butter crust. My version is sinfully dark and rich – don’t overbake it or it will be a brownie in a butter crust. Served warm with a scoop of vanilla bean ice cream it’s … well, try it and come up with your own adjectives. I’m fresh out. 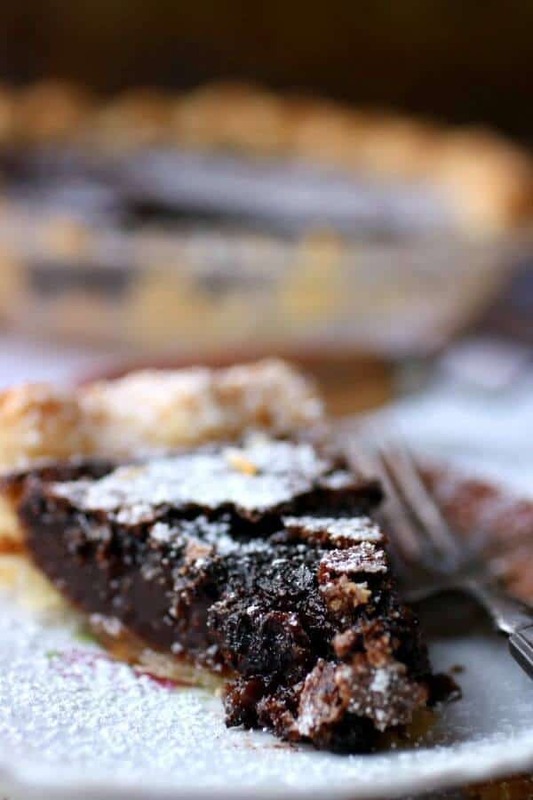 Remember Minnie’s Chocolate Chess Pie? This Ain’t It. 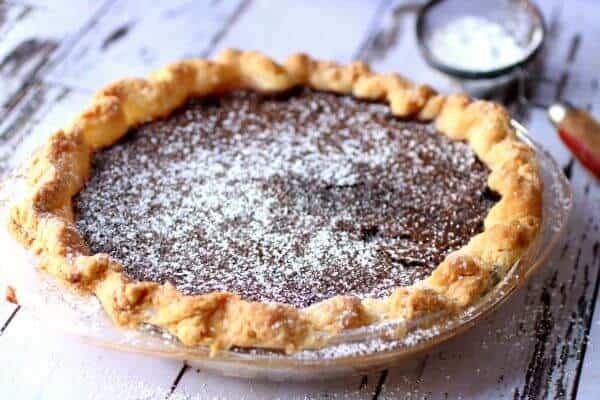 Chocolate chess pie is a Southern recipe that is undeniably the most chocolate of chocolate desserts. It’s like eating brownie batter in a butter crust – talk about decadent! If you’re looking for something that doesn’t need baking the German Chocolate Pie is very close to this in “wow” factor. While there are many varieties of chess pie, and probably as many chess pie recipes as there are Southern cooks, this heirloom confection is a favorite at our house. Make it once and it will be a favorite at your house, too! Sometimes I wish our society could be swept back into the days before tons of technology. Days when people walked, burned fat to keep warm in drafty houses, and constantly moved – you know – back to the days when eating a slice of pie like this wouldn’t cause a 40 pound weight gain. Sometimes? Make that most of the time. This chocolate pie, though. I think it got it’s national renown when the movie, The Help, came out. This is the pie that Minnie served to her former employer. Well, not this pie. We definitely don’t want her secret ingredient. 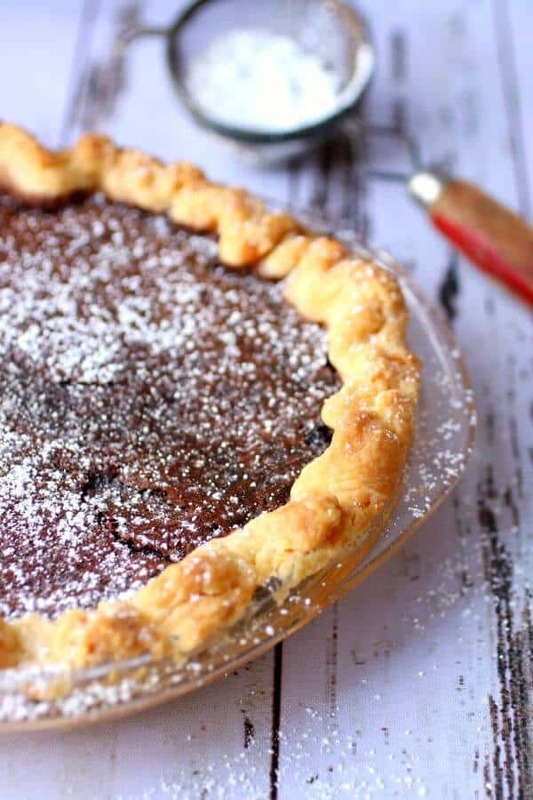 In any case, national renown aside, chocolate chess pie has been known in the South for a good number of years decades centuries. Almost everyone I know has had it at one time or another and I don’t know anyone who doesn’t like it. I think this particular pie recipe is as iconic in the South as Dutch Apple pie is in the Northeast. Yes, it is tooth-achingly sweet and stomach churningly rich. After all, it’s a Southern dessert – that’s what we do — and we do it real well. This is rich – a dusting of Confectioner’s sugar is the perfect topping for this decadent chocolate dessert. If you’re really into sweet + rich add a big spoonful of this homemade whipped topping! If you hate to make pie crust or don’t have time don’t sweat it. A purchased crust works fine. I find that I prefer extra dark cocoa to the regular cocoa that most recipes call for. It makes it more fudgy and decadent. This is not a creamy pie. It’s not like a custard pie, either. It’s really something in between – and hard to explain. Some people like to add pecans to chocolate chess pie. I love pecans but not in this recipe – I have texture issues. You can try adding some chopped pecans if you really think this chocolate pie needs something else to make it even better. Personally, I like it without anything extra. This easy chocolate dessert will keep for several days tightly covered in the refrigerator. I have heard that you can wrap the pie tightly and freeze it – I’ve never done it so I can’t comment. If you do, could you please come back and leave a comment and tell me how it worked out? If the pie is being served out of the fridge warm it up for maybe 10 to 15 seconds in the microwave. YUM. I’d suggest cutting this chess pie in smaller pieces than normal. You can probably get 12 slices easily. Try this if you’re looking for a more traditional chocolate cream pie. What constitutes a chess pie? A basic chess pie has eggs, sugar, butter, and cornmeal. Over the years there have been numerous variations including lemon and chocolate. Basically it’s a chess pie if the filling has a slightly firmer than cream filling consistency – almost like a batter. There should be a thin crispy layer on the top. This Southern specialty has so many variations I’m not sure there’s an easy answer! Do you need to refrigerate chess pie? Yep. Since eggs and milk are included it needs to be refrigerated or eaten within 4 hours of pulling it out of the oven. Can I substitute milk for the evaporated milk? You can but I don’t recommend it. It throws the texture off. If you must then simmer whole milk until it’s reduced by half. If you can’t do that use part milk and part cream. 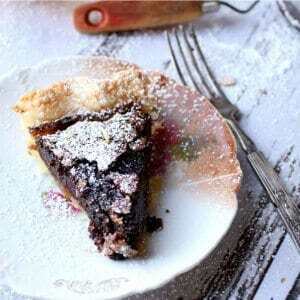 AND if you can’t do that just use milk – because you have to try this pie! NOTE: ANY substitutions will create a slightly different result – the pie may be less firm, for example. Can I substitute margarine for the butter in this pie? No. Well, yes but only if you are allergic to butter… because margarine is NOT as good as butter in this pie. How do you know when this chess pie is done? The most common test to see if this chocolate chess pie is done is to insert a table knife about an inch from the center of the pie. If it comes out clean, it’s done. Pecan Pie is just as rich and gooey as a red crayon left in the back seat of the car in July. But I promise it tastes MUCH better. Coconut Pie is oddly similar to the pecan pie but uses sweetened, flaked coconut instead. I think it’s addictive. Millionaire Pie is piled high with a creamy cloud of pineapple, coconut, and maraschino cherries. Best of all – it’s no bake! Lemon Icebox Pie is just like the one your Memaw made and served sorta frozen but sorta not on the hottest afternoons. Salted Caramel Pecan Chocolate Pie from Crazy for Crust looks spectacular. What do you think? I use this glass pie pan – it’s deep enough that the filling shouldn’t overflow. There’s been some issues for some people because they use an 8-inch pie pan. Don’t because it will make a mess. This easy pie recipe is about to become a family favorite! If your family loves chocolate desserts as much as mine does you’ll be making it often. 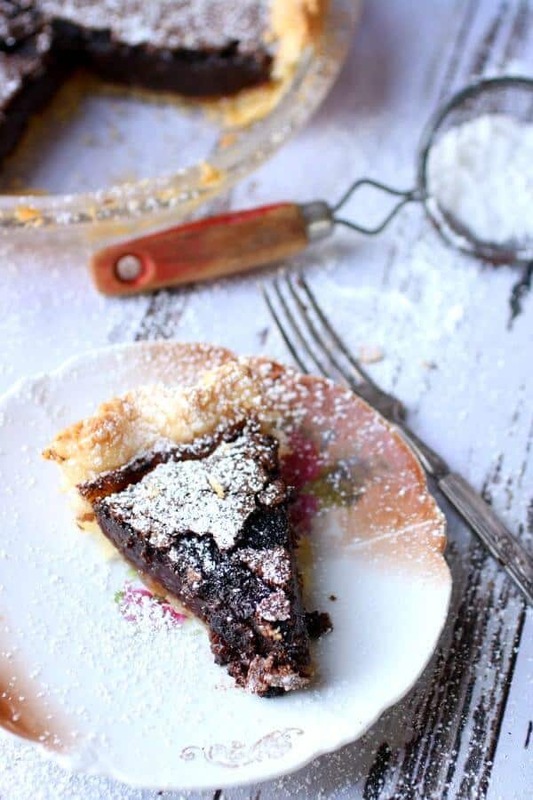 This rich, dark chocolate chess pie is a Southern classic – and with good reason. The top develops a fragile crispy layer and underneath is pure fudge goodness. It’s like eating brownie batter only better. It’s so rich you may be able to get 10 to 12 servings. Use a purchased crust if you prefer. Add the flour, sugar, and salt to a large bowl. Grate the butter into the flour mixture using the coarsest size grater you have – or slice the butter in thin sheets into the flour with a vegetable peeler. Mix the butter in until it is well coated with flour. Stir in 1/4 cup of ice water, mixing with a fork until the water is absorbed and the dough comes together. If it’s still crumbly you may need a little more water – just a tablespoon or two. Flatten the dough ball, wrap it in waxed paper and chill for a couple of hours. When you’re ready to make the pie roll the dough out and fit it into a 9-inch deep dish pie pan. Add all of the ingredients, except the crust and optional toppings, into a mixer bowl. Beat on medium speed for 2 to 3 minutes until very smooth. Bake for 40 to 45 minutes, or until the center of the pie is set. Remove from the oven and cool completely – it’s best if you cover and refrigerate overnight.